People can let their fingers – and hands – do the talking with a new touch-activated system that projects onto walls and other surfaces and allows users to interact with their environment and each other. 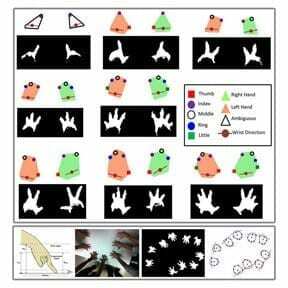 The system identifies the fingers of a person’s hand while touching any plain surface. It also recognizes hand posture and gestures, revealing individual users by their unique traits. The new “extended multitouch” system allows more than one person to use a surface at the same time and also enables people to use both hands, distinguishing between the right and left hand. Research indicates the system is 98 percent accurate in determining hand posture, which is critical to recognizing gestures and carrying out commands. The technology has many possible applications, said Karthik Ramani, Purdue’s Donald W. Feddersen Professor of Mechanical Engineering. Findings are detailed in a research paper being presented this week during the Association for Computing Machinery Symposium on User Interface Software and Technology (ACM UIST 2012) in Cambridge, Mass. The paper was written by doctoral students Sundar Murugappan and Vinayak, who uses only one name, Elmqvist and Ramani. The system uses the Microsoft Kinect camera, which senses three-dimensional space. The Kinect camera senses depth, making it possible to see how far each 3-D pixel is from the camera. The researchers married the camera with a new computer model for the hand. That camera coupled with the hand model allows the system to locate the center of each hand, which is necessary for determining gestures and distinguishing between left and right hands. Researchers explored possible applications, including one that allows the user to draw a sketch with a pen and then modify it with their hands.